What (if anything) do you celebrate on February 14th? For some the day is just another corporate-driven excuse to spend money; as the credit card bills from last year’s Holiday season are coming due. 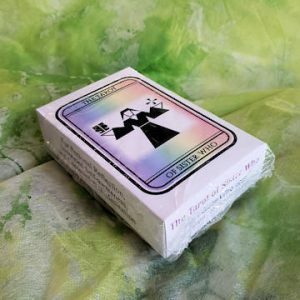 There are many queer folk who tune it out as a very hetero event; far too similar to legal weddings that, for so long, has been denied us. Another reminder of our fight for respect and equality. 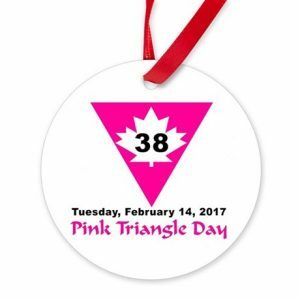 Such feelings were no doubt part of the reasoning behind the 1979 declaration of February 14th as Pink Triangle Day by the membership of the Canadian Lesbian & Gay Rights Coalition. “We realize that this date, February 14th, has traditionally been celebrated as St Valentine’s Day and dedicated to the expression of heterosexual affection. 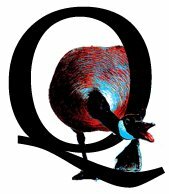 We take this opportunity to challenge what Christopher Isherwood has called the “heterosexual dictatorship” by affirming for ourselves and for the world, the existence, the strength, and the beauty of gay love. Although still not an official holiday, some of us continue to celebrate the holiday, and the sentiments behind it. 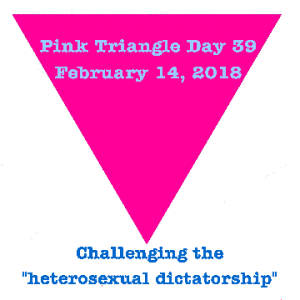 Whether you focus on challenging the “heterosexual dictatorship” or celebrating and honouring the love in your life, February 14th does not have to only be known as Valentine’s Day. Each year I create a new design to mark the occasion. The 2019 design is available on t-shirts & totebags from our print-on-demand shop at TeeSpring- just in time for year-end gift giving. 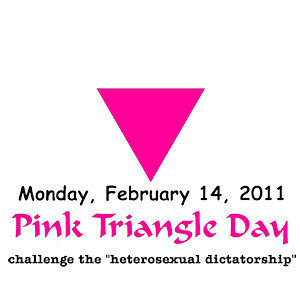 Declared in July of 1979, the first Annual Pink Triangle Day was observed in February of 1980. 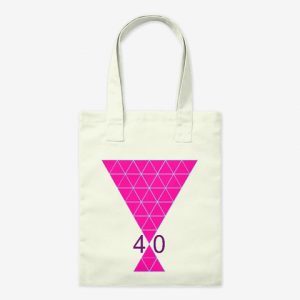 That means that 2019 will be the 40th annual Pink Triangle Day. My design is much more complex than previous years. 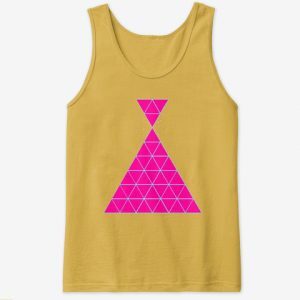 It includes one large pink triangle consisting of 36 smaller triangles point-to-point with a smaller triangle made of 4 even smaller triangles. 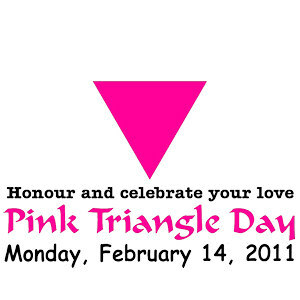 The historical Pink Triangle worn in the Extermination Camps was displayed point down. When the symbol was reclaimed by gay activists. many chose to flip it and display with point up. I was one of the folks who continues to use it with the point down; “down with oppression” as well as being a reminder that it was worn point down in the camps. The smaller triangle at the bottom not only includes the 4 necessary to make the design total 40 small triangles, it also suggests the larger triangle is crying over the pain of our abuse- or perhaps symbolizes the blood queer folk too often shed. But in a subtle, perhaps tasteful and graphical, form. 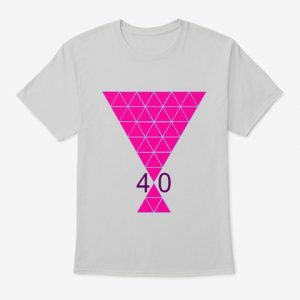 For those who prefer to have the main triangle point up, I have flipped the triangles (and removed the ’40’) on a small range of shirts as well.